Redlands, California—Global smart-mapping leader Esri and the ArcticDEM project, a public-private initiative to produce high-resolution, high-quality digital elevation models (DEM) of the Arctic, have released new elevation models and enriched those previously released. 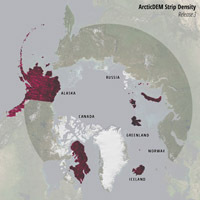 The ArcticDEM project is a collaboration between government agencies, the Polar Geospatial Center, and Esri to achieve goals set by a 2015 executive order by President Barack Obama,” calling for enhanced coordination of national efforts in the Arctic to reverse the trend of climate change. Coupled with the accessibility of Esri's online platform, ArcticDEM can meet the need for high-quality elevation data in remote locations and provide accurate measurement of topographic change. "This new Arctic elevation data is another demonstration of the power of technology and innovation in deepening the ways we can appreciate the immense value of our shared Arctic," said Ambassador (ret.) Mark Brzezinski, executive director of the Arctic Executive Steering Committee at the White House. New elevation models on Esri's public online portal show stunning surface detail from Baffin Island, Svalbard Islands, and Iceland. In many locations, the models are created images collected on multiple dates, allowing anyone to see the landscape changes over time, such as the rate at which glaciers are receding. Since the Arctic region is uniquely challenged by the effects of climate change, including melting ice, this elevation data provides a great resource for enabling better planning and adaptation. For instance, elevation models can help local communities monitor coastal erosion in order to identify important structures at high risk of storm damage. "Esri is excited to provide this continually updated elevation data as easy-to-access web services and apps," said Peter Becker, ArcGIS product manager, Esri. "These new detailed surfaces, which provide a much better picture of how the Arctic region is rapidly changing, allow more effective risk management for Arctic communities." Explore visualized data from the ArcticDEM project at the ArcticDEM Explorer.